Sean Koreski - Master of the Pan Flute, Live in Condon Oregon. Sean Koreski, is Master of the Pan Flute. He specializes in playing some of the most Beautiful Music in the World! He has played the Pan Flute for most of his life and Since 1996 He has inspired and captivated countless Audiences at his Concerts. 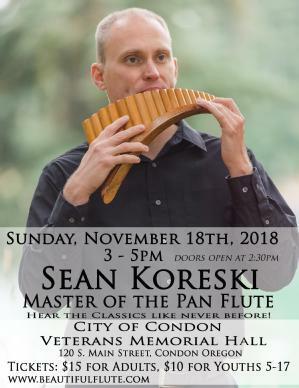 Through the Pan Flute, His Concerts feature a unique and beautiful twist on Classical Music. His Music is haled as being like hearing the Classics for the first time and being like a Musical Adventure. His Mastery spans through the works of Bach, Mozart, Tchaikovsky, Purcell, and others…. A musical Experience like no other!